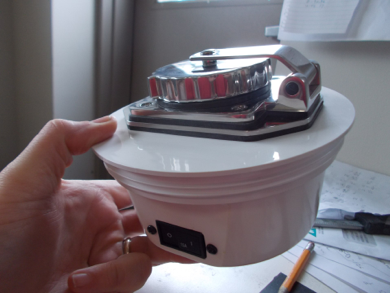 Its a removable shore power system adapted to screw into a 6” Beckson deck plate. • 30 Amp sealed shore power inlet. • Dual leg 15A Breaker. 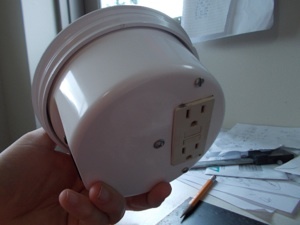 • Ground fault detecting 120V outlet. • Screws into a standard Beckson 6” deck plate ring. Ring not included. Another spinoff from The Dart project; AC deck plates. We had a customer that needed to run shore power in his Dart while it was sealed up. 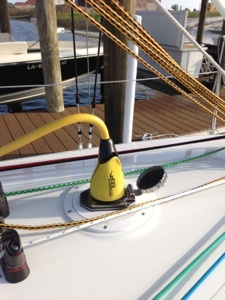 Instead of installing a traditional, complex, expensive and heavy dedicated shore power system, we came up with this simple solution. Need shore power? Just screw this into the existing deck plate ring on the cabin top. Going racing? Unscrew it and leave it at the dock. Going cruising? Toss it in a locker for use at the next marina. Shore power on the go!